Two weeks ago, most places were deserted, Keswick was empty and the roads were quiet, then suddenly last week, it all came to life again, car parks were busy, Keswick was buzzing, Luchini’s van was back on Whinlatter and lots of people were out and about – it was half-term and the start of the new season! The weather was kind and people were able to walk at all levels although it was said to be very windy on the tops, strange as it was not noticeably windy in the valleys. There were some beautiful days at the beginning of February, snow on the tops of the fells, clear blue skies and very little wind. 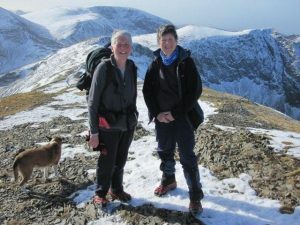 In the west we have had virtually no snow on the ground and the snow on the fells has all been above about 1500 – 2000 ft. One can’t let these good days pass by so on one of them Judy, her husband, John, and I did a shortened Coledale Horseshoe – Grisedale Pike, Eel Crag, Sail and Outerside; we were walking in snow on the tops under blue skies, a good to be alive day! 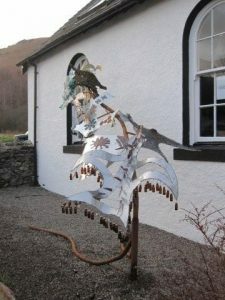 On the way down, we came through Braithwaite, passing what is now the Keswick Orthodox Church (was the old Methodist Chapel) where there is a very interesting sculpture of a flock of birds symbolising ‘freedom, free expression and openness.’ It is there for a while before being transferred to Grizedale Forest. The beginning of the year is always busy with work on the Cottages, getting them ready again for visitors arriving. This year all the major work is being concentrated on one cottage, Crummock, which is currently having a new heating system installed, being redecorated and having new carpets throughout. I am also busy restoring Foulsyke to one dwelling: several people have asked if I am going to let the House but it will remain my somewhat extended home. I always seem to be commenting on how lovely the snowdrops are at this time of year: they have been beautiful and there are lots of them on banks and in hedgerows as well as gardens. 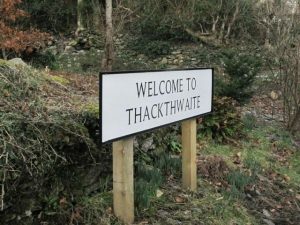 The Thackthwaite road is particularly good which reminds me of something else, Thackthwaite has now got a village sign! PS Sunday 26 February: Whilst taking Wattie for his morning walk in the woods behind Foulsyke, I saw the first frogspawn in the watery ditch alongside the path!